Oslo, Norway – September 21, 2018 – Vewd, the world’s largest smart TV OTT software provider, unveiled at IBC 2018 multiple OTT solutions and its new Chief Product Officer, Sascha Prüter. These announcements form part of the company’s commitment to pioneering OTT developments which shape the future of TV consumption. The appointment of Mr. Prüter, the former head of product for Google’s Android TV, and the introduction of Vewd’s new solutions collectively advance Vewd’s offerings and position within the fierce OTT market. Vewd unveiled Vewd OS for Android TV operator tier, bringing the company’s signature smart TV technology and essential modules to Android TV. Vewd OS enhances Android TV by speeding time-to-market and reducing CapEx with a turnkey experience and extensive product modules that adhere to core Android TV requirements. This extended functionality includes a holistic home screen experience for Android TV’s Operator Tier, a complete OTT application environment loaded with key regional and local apps that complement, yet extend, Google Play, a state-of-the-art Electronic Programming Guide (EPG), and extensive platform data and analytics available through Vewd Cloud. Vewd announced that Sascha Prüter, former head of product for Google’s Android TV, has joined the company as Chief Product Officer. At Vewd, Mr. Prüter will lead all product management efforts with a special focus on Vewd’s emerging portfolio of pay TV operator products, including Vewd OS for Android TV. Mr. Prüter understands how to design compelling OTT products and has deep commercial insight relevant to global pay TV operators and leading OEMs. His experience creating world-class solutions aligns with Vewd’s strategic product roadmap. Vewd introduced Vewd Atom, a breakthrough OTT solution that seamlessly brings today’s most important apps and streaming experiences to operator devices previously incapable of accessing OTT services. Vewd Atom’s virtualized OTT architecture consists of Vewd’s industry-leading OTT platform running in the cloud that is seamlessly connected to an ultra-lightweight client on the device. It delivers substantial business benefits to operators including significant CapEx reductions, new revenue streams, and the ability to deliver the OTT apps users demand. Tivù, the company that manages Italy’s leading free-to-view satellite TV platform tivùsat, has become the world’s first operator to deploy an HbbTV Operator App (OpApp) together with Vewd. Along with Tivusat’s partners, Opentech and Yotta Media Labs, Vewd are proud to be part of Tivù’s first deployment of HbbTV Operator Apps which offers customers a more engaging and branded user experience with the freedom to choose any set-top box supporting the OpApp spec. Vewd and Opentech, one of South Korea’s leading set-top box manufacturers, announced a multi-year contract that adds Vewd Core, and Vewd’s award-winning HbbTV 2.0.1 and newly released Operator Applications modules to their set-top boxes. The new agreement will result in the first deployment of set-top boxes supporting the new HbbTV Operator Application standard. Vewd announced Vewd Go, a turnkey streaming media player reference design built for operators to boost subscribers by directly addressing the fast-evolving demands of the OTT generation. Built on Vewd OS technology, Vewd Go empowers operators by allowing them to be the native experience that connects and grows their subscriber base while providing third-party content that consumers know and love. With many operators investing in their own connected TV apps, Vewd Go can help recycle those investments by integrating these apps as the hero experience of Vewd Go, a benefit unavailable to operators with off-the-shelf streaming media players. 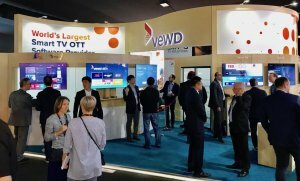 Together with Vewd and MediaTek, one of the world’s largest semiconductor companies, BBC R&D showcased its latest Hybrid Broadcast Broadband TV (HbbTV) advancements in content substitution at IBC2018. Vewd optimized Vewd Core, as well as the Vewd Core HbbTV module, to support some of the BBC’s most advanced use cases, including personalization and content substitution. Vewd showed the power of Addressable TV, together with Google Ad Manager, S&T, and Ateme. The demo used HbbTV, the leading standard for blending IP content with a live broadcast, deployed in Europe, Asia, and Africa. In the demo, a full commercial break consisting of three ads in broadcast was replaced with a similar, targeted ad group streamed over MPEG DASH. The signaling of the upcoming ad break is done using events in broadcast according to HbbTV. For more information about Vewd’s IBC announcements and presence, visit https://www.vewd.com/press-news/.